Performing Worlds into Being: Native American Women’s Theater. Edited by Anne Elizabeth Armstrong, Kelli Lyon Johnson, and William A. Wortman. Oxford, OH: Miami University Press, April 2009. Paper: ISBN 978-1-4243-3112-3, $29.99. 186 pages. Entering this text is entering a theatrical world of Indigenous voices speaking words of truth, and a retelling, or rather, a re-knowing of Native American history. While the material in the text represents Native American Women’s theatre, the contributors offer the Native and non-native theatre practitioner feminist perspectives on materials chosen for performance as well as styles of Indigenous theatrical performance. This offering of the NAWPA collection make it clear that there are many opportunities for further exploration in academic and performance settings. The Native American Women Playwrights Archive was founded in 1997 as a “living archive by sponsoring readings, performances, and conferences” (iii). This volume is the representation of their third conference at Miami University (Oxford, OH) where the archive is kept. Performing Worlds into Being: Native American Women’s Theater is a fitting example of the work that NAWPA is doing to keep Native American theatre present and alive within both the academic and performance communities. The scholars, artists, and theatre practitioners represented in this book include Indigenous peoples from Canada, Mexico, Central and Caribbean America, and Pacific Islands. A recurring theme throughout this text is that “storytellers are the rememberers” (75). All of the contributors explore this Native American cultural norm. Theatre and feminist literature scholars can turn to Section I: Looking Back, Looking Forward for a critique of Native American myths and legends. These stories are “known” to our current culture as they were told to us from a seventeenth-century European male perspective. This section re-examines the story of Pocahontas bringing her back to the truth of her tribe and the customs she honored and challenged. The keen analysis offered by scholars such as Jill Carter in “Blind Faith Remembers” brings an understanding of Native American theatre that has been lacking in the traditional theatre classroom. Section II: Honoring Spiderwoman Theater is a most invaluable section for those artists interested in creating their own work. This section is accompanied by a DVD with selections from Spiderwoman Theater’s performances and a photo archive of their extensive body of work. Section III: Voices offers concrete examples of play texts written by Native American women for an audience accustomed to the Western style of theatre presentation. The large number of script excerpts provides a broad perspective on Native theatre, bringing to light a voice in the world that has been squelched for decades and is still frequently ignored in the overall theatre community. Section IV: Community and Collaboration brings the discussion of theatre back to the community, whether professional, community, or educational, and offers interviews with theatre artists who have focused their careers on creating and presenting Native American work for the Native American audience and the broader North and Central American audiences in general. Section 1: Looking Back, Looking Forward offers an attack on the past and the need to learn from the wounds of that past. These stories, including the story of Pocahontas and general awareness of Indians to most non-native peoples, was shaped by the perspective of seventeenth-century British working-class soldiers. Monique Mojica, Ric Knowles, and Jill Carter make their point clear that it is important to re-learn Native American history through the knowledge and history of the Nation tribes themselves, not the “white man’s” narrative anymore. Monique Mojica’s re-interpretation of Pocahontas’s story does not stop at fixing the romantic version told through storybooks and cartoons. She delves into the wounds of Native peoples and forces her audience to face them with her. “When we make a decision to create from a base of ancestral knowledge, we confront the rupture, the original wound” (3). While Mojica’s play Sky Woman Falling is offered in this text, her critically important play Princess Pocahontas and the Blue Spots is not included. The critical analysis of the latter play, the real story of Pocahontas and of Mojica’s performance technique, would have been well served by offering this play either in the book or as a performance on the accompanying DVD. Many artists and scholars refer to Mojica’s play, Princess Pocahontas and the Blue Spots, throughout this book, so its inclusion would have been an added asset. 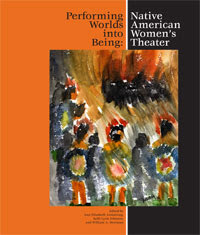 The Honoring Spiderwoman Theater section is valuable for its practical application for devising new work, the sharing of the history of the women involved in creating and sustaining this unique theater company, and samples of their work both in print and on the accompanying DVD. The information and techniques are useful for practitioners and for the theatre classroom. According to Murielle Borst in her essay “Spiderwoman Theater’s Legacy,” “the technique through which they combine storytelling, acting, and writing to create their kind of theater” is the main legacy of Spiderwoman Theater from which we can all benefit. Borst goes on to state, “Storytelling is a key aspect of Spiderwoman’s technique, whether traditional or non-traditional” (75). The artists in Spiderwoman Theater ignore the traditional Western style of theatre. Their performances are based on text written in response to events in their lives and expressed through traditional Indian storytelling techniques such as drumming circles, dance, and the aspect of spirituality in their text and stories. One concept explored by Marcie Rendon is the confusion of being white or Indian in her poem “What’s an Indian Woman to Do?” (58-59). Section III: Voices includes several examples of Native American plays by women. Many reflect the Western Aristotelian model of theatre (plot, character, theme, spectacle, diction, music). These scripts open readers to the depth and breadth of NAWPA’s archival material. This section offers material that any Native American or non-native theatre company interested in telling the stories of Indigenous peoples could produce. This “normal” model of publishing houses selling the scripts and rights to perform plays is in contrast to material explored elsewhere in the text. Several of the artists, including Spiderwoman Theater and Monique Mojica, develop their own work with voices that are not necessarily meant to be spoken by other women. They create their own story for themselves to perform, not others. Section IV: Collaboration and Community offers enlightening and useful interviews with working Native artists. “Theatre in the House/Raving Native Productions,” an essay by Marci Rendon, offers identifiable and reproducible techniques in playwrighting, rehearsing, character creation, and story creation in an educational as well as community center setting. This section beautifully reflects the overall premise of this collection, including the need to tell Indigenous stories, the desire to find universality, and the need to honor specificity of why these stories need to be told, shared, and saved. Many of the theatre practitioners in this section suggest a desire to wait to be invited by communities they wish to serve. They help those communities tell stories they are ready to share rather than forcing their story upon the community. Contrast this aesthetic to the authors and artists represented in earlier sections of this text, who take an activist feminist perspective. They explore the wounds they and their people have suffered for hundreds of years, and with guerilla theatre precision, force their audiences to face the truth with them.